It’s a fact of life that most regional and state newspapers rarely make it past the boundaries of their reader locale. And why would they? The local news is generally only interesting to the locals, and any news that extends past that would be similarly covered by other newspapers. Many people couldn’t even name the local newspaper of a town in a neighbouring state (unless of course, it has ‘Advertiser’, ‘Courier’, ‘Mail’, ‘Herald’ or ‘News’ in it, as most of them tend to). But there is one small Australian newspaper that defies this logic, and has made a name for itself on the worldwide stage. You couldn’t say that the NT News is famous for its quality journalism (even the staff there wouldn’t claim that as a reason), but this small Northern Territory newspaper is renowned for its crazy front page articles and wacky headlines. Thanks to the internet, the newspaper has achieved notoriety on a global scale with its leading articles about crocodiles, cyclones, UFOs and unusual people. This book hosts a collection of some of the best front pages that the newspaper has had on offer over the last five or six years. Witty headlines (with just a little innuendo), ‘different’ photography and a habit of pushing the envelope just a tiny bit further than other newspapers, has meant that the NT News has developed a strong following by people interested in the crazy going-ons of our Northern Territorian neighbours. After all, where else would you find a ‘mutant 5-Legged Toadzilla’, a man stabbed with a fish or a jailed crocodile? 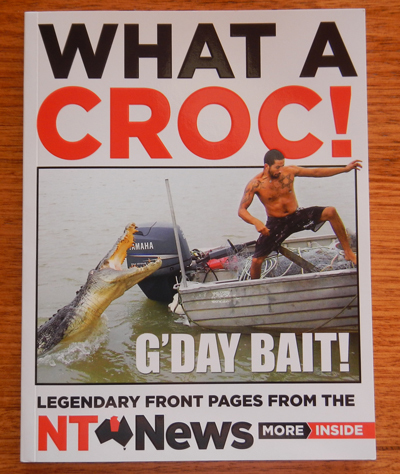 If you know someone who finds pleasure in reading the NT News headlines, or simply enjoys a zany news item or two, then you already know the perfect recipient for this book. Would you read a political memoir? OMG - Where did you get this book? We lived in Darwin for a few years and we used to LOVE the NT News front pages. I'd love to get this book for my partner!